Dave Fornell has been a World War II re-enactor for 28 years. When you ask him why, at first, the child in him peeks out. In his next breath, the adult with a sense of moral obligation speaks. That’s why Fornell and hundreds of other re-enactors do repeat themselves every September at World War II Days, a weekend-long event at Midway Village Museum in Rockford. These are more than hobbyists. These are teachers. And the expansive museum grounds serve as a grand classroom. 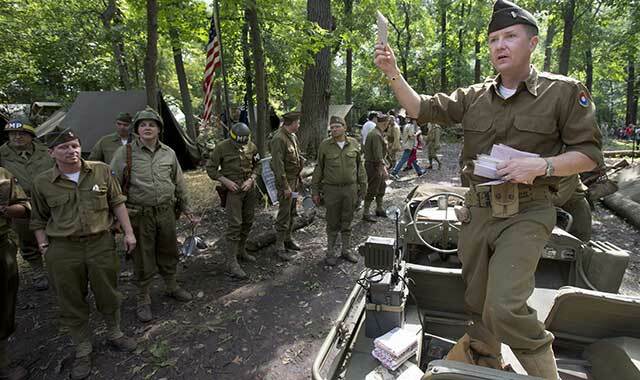 This year’s event takes place over three days, with the “Behind The Lines Tour” on Sept. 21 and the actual World War II Days taking place Sept. 22 and 23. “It’s the largest two-day event at Midway Village and the second-largest World War II re-enactment in the country,” says Lonna Converso, the museum’s director of marketing and social media. According to Fornell, who is the overall coordinator of the event, roughly 1,200 re-enactors take part in the three-day event. Not bad for a presentation that started 22 years ago with roughly 100 re-enactors. And it’s more than just the players. There are roughly 90 scenes – or units – throughout the grounds with anywhere from five to 90 re-enactors in each one. The main focus is devoted to the war in Europe, but there are areas set aside for the Pacific. “We try to cover all facets,” Fornell says. It’s not just battles that are re-enacted here. Spectators are encouraged not only to see the displays and watch the battles, but to get directly involved. In fact, Fornell says some of the best questions come from the younger generation. The family-friendly atmosphere, combined with the size, scope, authenticity and attention to detail, are what draw nearly 9,000 spectators to the annual event. Daily tickets to World War II Days are $14 for adults, $12 for veterans and active-duty military, $8 for children ages 3-17, and free for kids under 3 as well as museum members and World War II vets. Purchase tickets online at midwayvillage.com or at the gate. Parking is $2 for non-museum members. The Friday night “Behind the Lines Tour” does not feature live battles. McGhghy calls it more of a preview. Then on Saturday and Sunday, the action begins. This entry was posted on Friday, August 17th, 2018 at 12:00 pm	and is filed under Recreation & Destinations, Top Posts. You can follow any responses to this entry through the RSS 2.0 feed. Both comments and pings are currently closed.